When you have a septic system on your property, you need to be sure that you are doing all that you can to care for it properly. Not only does this mean knowing what you should avoid putting into it and how you can care for it, but you also need to think about regular repairs and maintenance services to keep it in great working condition. 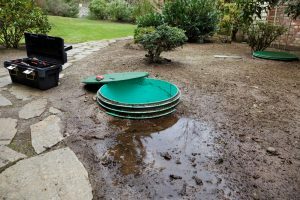 As your number one septic repair service in Edmonds, Schleg Valley Construction will be happy to work with you to keep your system operating beautifully. The septic system works by processing all of the wastewater from your home. Solid debris will settle down at the bottom of the tank and then any of the lighter waste will rise up to the top, which is known as the scum layer. In between these two layers will be clarified liquid that flows through an outlet pipe and then taken care of through the drain field. Whenever there is some sort of hiccup in this process, it can cause the entire system to go out of whack. Once you notice that there is some sort of issue with your septic system, you can call our team of septic professionals to come out to your location. We have all of the training and state of the art technology to make an assessment and then formulate a plan to perform the necessary repairs for you. Having the peace of mind in knowing that you have trained technicians working on your property is a great feeling. We look forward to offering you all of the septic maintenance and repairs that you could ever need. It is always our goal to ensure the best results to keep your septic system in great working condition. It is important to work with professionals when looking for a septic repair service in Edmonds. Call Schleg Valley Construction at (425)312-6750!